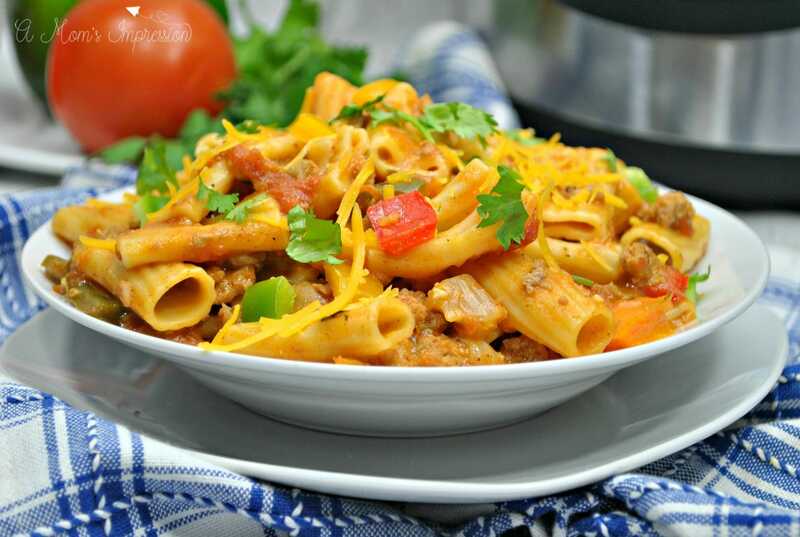 Make Instant Pot Cheesy Taco Pasta in just minutes using your pressure cooker. Full of all the taco flavors you love, this is going to be a favorite! School has started and so has soccer and gymnastics. This time of year is crazy busy and that means finding easy recipes that the kids enjoy so much it doesn’t take them an hour to eat it. 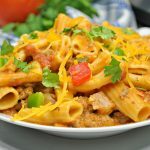 This Instant Pot Cheesy Taco Pasta recipe is quick, easy and the family loves it. It is a nice change of pace from our usual Taco Tuesday. I love finding kid-friendly Instant Pot recipes that I can make in a flash for those busy school nights. If you haven’t tried pasta in your pressure cooker, you need to! 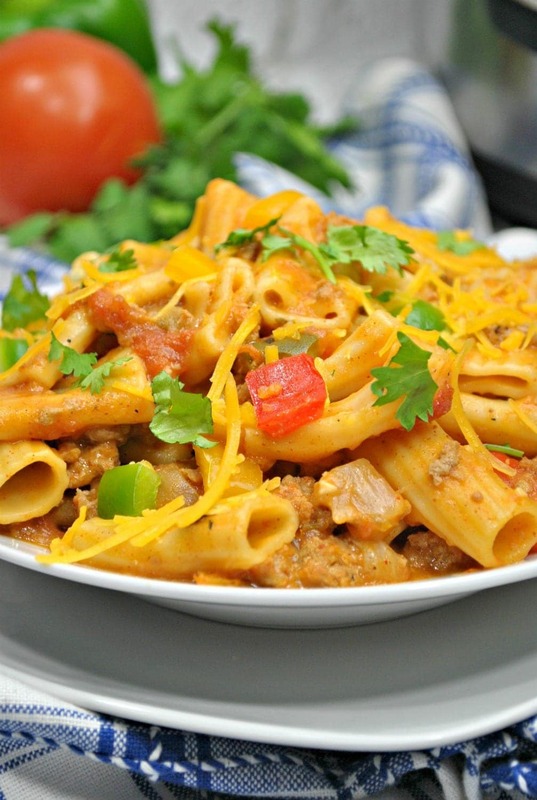 Our Crack Chicken Pasta is one of our most popular recipes here on amomsimpression! 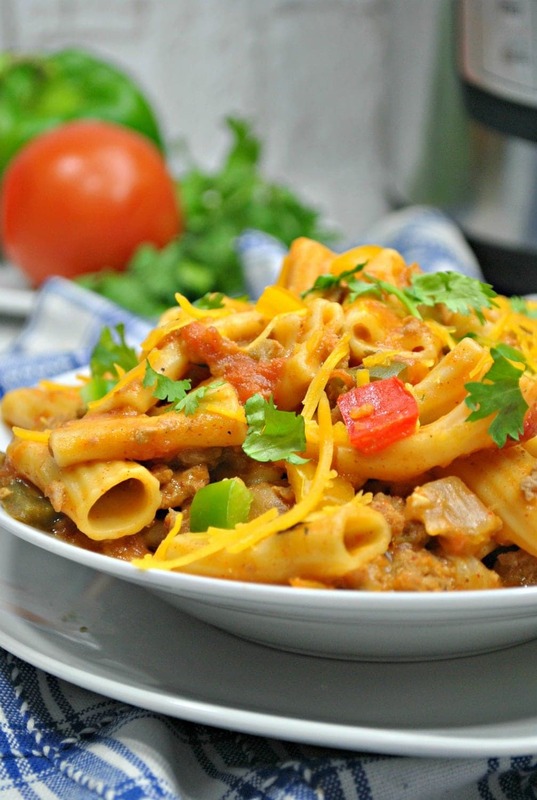 This cheesy taco pasta is also very budget friendly. The kids and I figured that this entire meal cost us about $8 and there was enough left over for lunch the next day! If you only have 4 people in your family to feed, feel free to cut this recipe in half and get a meal for under $5! If you like budget-friendly meals check out our list of healthy recipes for under $15! Place Instant Pot to Saute mode and add olive oil. 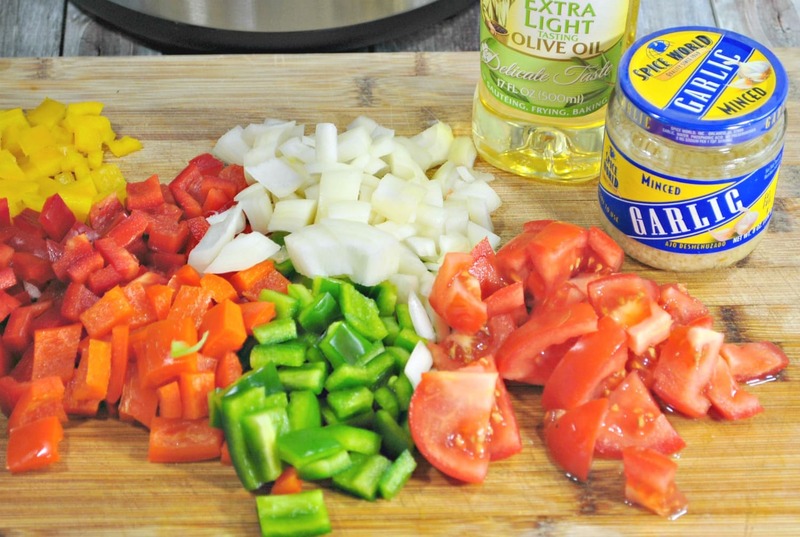 Add peppers, onion and garlic and cook for a few minutes. Add ground beef or turkey and cook through. Add the taco seasoning and red pepper flakes and stir well. Add Salsa, broth, and pasta. Stir to combine. Secure lid and turn Instant Pot back on. Set on manual high pressure for 5 minutes. When cooking time is finished, quick release the pressure. Take the lid off and add cheese to the pot. Stir to combine and to melt cheese. Serve garnished with tomatoes, cilantro, sour cream and more shredded cheese. Add Salsa, broth and pasta. Stir to combine. When cooking time is finished, quick release the pressure. Take lid off and add cheese to the pot. Stir to combine and to melt cheese. For some reason my instant pot said burn when I made this recipe. I deglazed the pan after I sautéed everything. Any thoughts? Did you stir the pasta into the sauce before you set the pressure? The noodles need to stay on top of everything and then stirred in after cooking. That pesky burn notice is extremely frustrating… I’m so sorry.